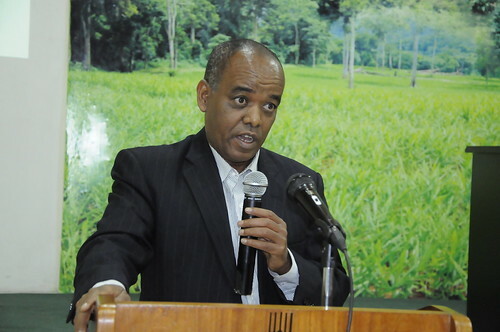 Getnet Assefa, principal investigator in Ethiopia and national livestock research coordinator at the Ethiopian Institute for Agricultural Research (EIAR), introduces himself and his work with the program. It is one of a series of portraits of key people in Africa Chicken Genetic Gains (ACGG) project. I was born on a small island on Lake Tana and went to school in Bahir Dar from elementary all the way to high school. Then I went to Haramaya University where I graduated in animal science. The Ethiopian Institute for Agricultural Research (EIAR) employed and assigned me at the Holetta research centre. I was mostly working on all aspects of animal feeds and nutrition there. Then I did my MSc study at the Swedish university of Agricultural Science for two years, during which I travelled to Vietnam and other countries. My research focused on Ethiopia and covered agronomy, animal science, surveys, quality etc. When I came back to Ethiopia, at Holeta, I worked as national coordinator for feed resources. I held that position for three and a half years and before starting my PhD in the Humboldt University of Berlin, Germany. I did my research here in Ethiopia on the evaluation of browse trees including aspects of quality, nutritional aspects and feeding performance. I then worked as national research coordinator for ruminants, from 2008 to 2010, before working as a national livestock research coordinator at EIAR. When ACGG came to Ethiopia I was the initial contact person in EIAR and I facilitated various aspects: Giving all the background information for the project and organizing different visits for donors and others. The project was initially designed as a demonstration project of poultry production for proven breeds. It became a project of genetic evaluation based on the feedback from farmers. We organized the project launch and the first innovation platform meeting etc. Before that, I was already communicating with the four regions (Amhara, Oromia, Southern Nations, Nationalities’, and Peoples (SNNPR), Tigray as well as the Addis Ababa City Administration) where we will implement this project to explain what the project is about. We ran a sensitization workshop with stakeholders from all regions to discuss detailed arrangements. Regional staff were given follow-up assignments to discuss with regions, zones and woredas to identify the potential areas and actual implementing sites etc. and then we developed criteria for implementing the project based on the population, area coverage and the potential of woreda etc. We also signed memorandums of understanding (MoU) between the regions and the project. We then sent the money to the regions to start implementing the programs by conducting a baseline survey – which is now nearly finished. We are now working on special arrangements to make our partnership agreements event more efficient. We are also facilitating the training programs. We plan to have the Addis Ababa university host training in August and have identified trainees from all regions. We are also arranging the preconditions for on-station activities with the breeds. We had to buy some facilities, arrange houses etc. and work with partners like Haramaya University as the experiment will be done in duplicate with them. The other important activity – and challenge – is getting the breeds. There were lots of ups and downs in finalizing the breeds. We identified the strains we want to evaluate and we are now working on importing fertile eggs. Some of them are already paid and near delivery. My function is to facilitate and coordinate all this work with the regional teams. In addition to this project, we have a lot of national poultry activities with on-farm demonstration activities, which complement ACGG. Baseline survey data: we want to see what the baseline survey tells us and we want to organize a workshop with statisticians and the International Livestock Research Institute (ILRI) to show some of our preliminary findings and produce a report. We also want to see what these findings implies at national level. It may help with the follow up actions of ACGG and at large it could be used to refine ongoing research activities and help design new programs for the country’s national poultry program. On-farm activities: we are about to start these after identifying those commercial farms that will assist us in growing or brooding our day-old chicks and dispatching them to the farmers. We have already organized on-farmer experimental analysis. We also need to continue arranging on-station experiments at Haramaya and Debre Zeit, alongside other smaller project activities. Why does this project matters and what gets you excited about it? This project is important because poultry is one of the priority growth sectors highlighted by the government. Poultry production is at a low level in Ethiopia but demand is high. Higher poultry production can address food security challenges in this country and reducing poverty and improving human nutrition. This project is also important because it is involving smallholder farmers who will be able to get (and sell) eggs and meat and improve their incomes. If you engage many smallholder farmers the total impact will be higher compared with involving commercial farmers. One of the challenges is in how to successfully engagement private sector actors, many of whom are hoping to benefit directly from this project. But our goal is for the direct benefit to go to the smallholder farmers. Some private sector partners want to see breeds delivered to farmers by the thousands but the project will only distribute to a few thousand farmers initially. But the private sector will benefit in the long run because in the longer-term we hope private sector partners can take over the development of selected strains. I am concerned about misunderstanding among some private sector actors. We need to be clear how we involve them and what their role is as well as how can they benefit from this project, now and later. There is also some reservations from some stakeholders about the strains we have chosen which is a cause for concern. This is because the dual purpose breeds which the project has identified are not common and getting them to function appropriately is not easy. But we believe that every breed has its own niche and we can identify the best-performing strains for each eco-agrology and we also looking to avoid diluting genetic materials we already have. From the research site we will take as much as possible in this process, but you never know exactly how it will be handled from the farmers’ side. Facilities are another area for concern: the project does not have vehicles and EIAR is supporting us with vehicles but if you look at the whole country and the sensitivity of the birds, the supervision of the work and response to farmer needs might be difficult. Renting vehicles is not straightforward nor quick. This is one of the problems I see. Otherwise, from the regions, people are very interested, strong and committed and they are supporting us. I do not know what will happen when we get down to the farmers’ level and we will need to effectively manage the administrative procedures at that level. We can identify the best breeds for different agro-ecologies and farmers will be become aware of the breeds most suitable for their areas and we hope that the project farmers and other farmers will ask for additional chicks and promising strains. ACGG also offers an opportunity for the private sector to be engaged in multiplication of day-old chicks, alongside their work in supplying other input like feeds. I think this project will improve links between smallholder producers and the private sector to drive the growth of the poultry sector in Ethiopia. This will also create jobs, especially for women and youth, many of whom are already engaged in the sector. I think the process of engaging the private sector will also need to pull in financial institutions to provide small-scale credit for women and youth, and we to look at the poultry market chains to support creation of markets and organize producers in cooperatives to ensure benefits reach more people. If the market fails everything else will fail. In addition, there should be training for smallholder farmers on improving nutrition, getting to markets and improve chicken performance etc. I hope this project supports a holistic poultry performance improvement approach in the country and that its best practices and technologies are effectively scaled out. Tags: EIAR, Getnet Assefa, voices. Bookmark the permalink.